You'll be £32.00 closer to your next £10.00 credit when you purchase The National Rifle Association Its Tramways and the London & South Western Railway. What's this? In 1859, as a result of the perceived threat to Great Britain from the large increase in conscript armies on the Continent and especially the growing power of France, and given further impetus by a public outcry for improvements in the Country’s defence, a new Rifle Volunteer Movement, based on that of the Napoleonic Wars, was quickly formed to great popular enthusiasm. This led, in the same year, to the formation of the National Rifle Association designed to encourage rifle shooting by the establishment of a great annual National Rifle Meeting open to both Volunteers and all-comers. There marksmen could compete for valuable prizes. To achieve this it was necessary to ensure that the location, initially on Wimbledon Common and later at Bisley, was readily accessible by train. An extraordinary relationship now developed between the Association and the London and South Western Railway Company, and its successors, in fulfilling these aims. The culmination of this was the construction of the Bisley Camp Tramway which connected the L&SWR mainline at Brookwood with the NRA Camp. Interlinked with this is the fascinating story of the Association’s own unique tramways. These carried competitors and spectators to the more distant ranges as well as targets to the butts and for mobile targets. The military extensions to the Camp Tramway in both World Wars are also covered. 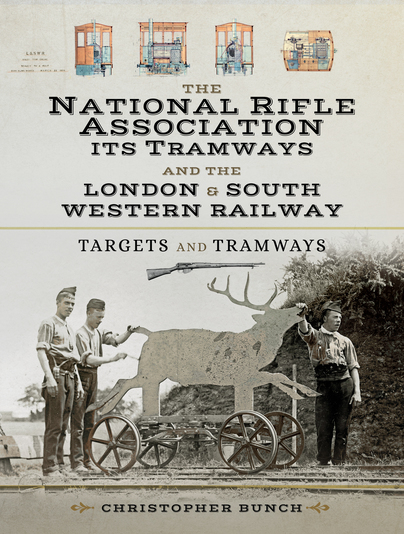 The book relates the history of the NRA and its tramways from its foundation until the end of the twentieth century largely through contemporary letters, documents and photographs. This volume was a delight to read, and bids fair to become the Standard Reference Work on the NRA, Bisley and Competitive Target Shooting in the United Kingdom. As such it is likely to be of interest to both Military and Social Historians and target-shooting enthusiasts of all persuasions. Members of the military may also find it of interest. Railway enthusiasts with an interest in both the London and South Western Railway and obscure, little known tramways, may also find it worthy of their attention. Railway modellers may also find the volume’s photographs and plans useful. The volume accompanied by maps of the various polygons, photos of the various protagonists of the association and various documents will not be lacking on the shelves of fans of history of transport and fans of British history in general (since the book covers a bow Very vast thunderstorm, coming almost to our days). Another great book by Pen & Sword! Christopher Bunch was born in Hampshire, where he still lives today. Whilst following a career with an international telecommunications company, he led tours of duty in Kenya, Mauritius, the Middle East and the Caribbean, before finally settling back in Britain. In retirement, after a spell in consultancy, he took up an interest in history. He acts as a part-time research assistant at the National Rifle Association Museum at Bisley and has written articles for the NRA Journal and the South Western Circular. In addition, he has also undertaken First World War studies for his local history society.